The National Flood Insurance Program (NFIP) will expire on July 31, denying necessary insurance coverage to homeowners and buyers in more than 20,000 communities nationwide. Congress must act now to reform and extend the NFIP. 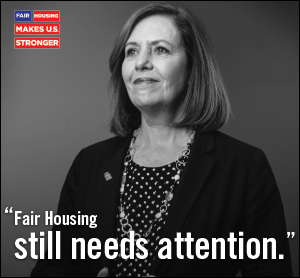 Take action by urging Congress to extend the NFIP and pass meaningful reforms to ensure long-term viability of the program. Gather at Grand Traverse Resort & Spa for the largest Michigan Realtors® event of the year! Revitalize your rapport with colleagues, engage with exhibitors and earn CE Marketplace certified credits from top rated speakers. The Convention is your chance to invest in your success this September. What are you waiting for? Registration is now open with rates starting at just $210. Thinking about attending for the first time? Look for the discounted First Time Attendee rate on the registration page and Go The Distance! Each year Michigan Realtors® offers a variety of educational content and opportunities to meets the needs of Realtors®. To make sure we are on the best path we have a few quick questions for you about what you need to help your business grow. Home improvement reality television shows have long misguided consumers about the renovation process. You likely have some clients who are obsessed with channels such as HGTV, and they may have developed some common misunderstandings about the real time and effort it takes to undergo remodeling a home. Fox News recently highlighted several myths these shows tend to generate. Season 2 of Letter of The Law is now available for purchase On Demand. The online course is CE Marketplace Certified for 2.0 hours of Legal CE. 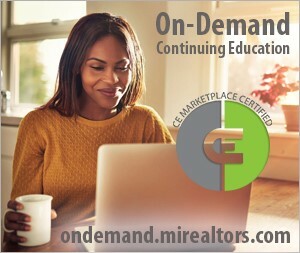 Are you using CE Marketplace to find Certified Courses? CE Marketplace is the only place to find audit proof CE before your license renewal day of October 31, 2018. Find certified courses in the CE Marketplace calendar. You can access the calendar from the CE Marketplace homepage by clicking on the Calendar in the upper right corner. Login is not required to view the classes, Advanced Search and On-Demand sessions. You can see a daily breakdown of upcoming classes. The calendar allows you to look for certified classes to meet your requirements based on instructor, topic, credit type, class location, and more through the advanced search options. For more information on how to use the CE Marketplace for all of your CE needs, visit us at www.cemarketplace.net or give us a call. We are happy to help - 844.642.6633. If you are interested in running for Michigan Realtors® District Director, nominations will be held open until Friday, July 13, 2018. 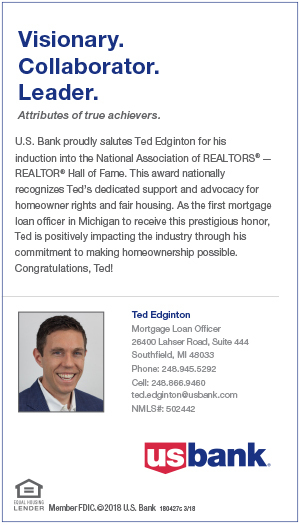 Nominations are open for Michigan Realtors® Director in the following districts: 1, 4, 6, 9, 11 and 14. I represent the seller. My client received multiple offers and based his choice in large part on the fact that the buyer had submitted a pre-approval letter from a particular lender. I just discovered that the buyer has applied for a mortgage from a different lender. Can she do that? Yes. The fact that a buyer presents a pre-approval letter from one lender does not obligate the buyer to use that lender unless the purchase contract explicitly says so. Buyers often switch lenders and are ordinarily free to do so as long as they meet the time deadlines in the purchase contract. 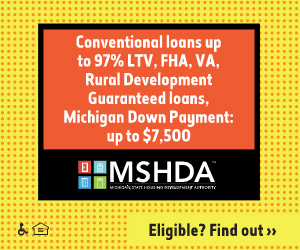 The Michigan Realtors® want to help you save money on the tools you need. You are entitled to 10 percent off your entire Realtor.org Store purchase. Simple type in the promotional code MI2 and the amount will automatically will be discounted. You can also apply the promotional code to phone and fax orders. It really is that easy to save money, and with this simplicity, there is no reason not to use the code and save! Visit the REALTOR.org Store to view available products. Don’t forget to use your discount by typing in MI2 at checkout!